Think of all the bands that have emerged from the UK and how they have impacted audiences on a global scale. And then think about all of the up-and-coming bands out of the UK that just have that signature sound to allow them to fall into that instant stardom. Enter Daze One, whose sound immediately directs your thoughts to Travis, Coldplay and the like. Their new EP, The Laws of Science is an added gem to anyone’s collection if they are even minor fans of the genre. Hum-a-long melodies, vocal harmonies and a strong deep lead voice are essentials in arena bands and Daze One captures all requirements flawlessly. “Laws of Science”, the title track on their 4th EP is a catchy tune that is truly that of the UK. “Circles” seems to be the strongest song on the EP, as the power ballad worthy of an epileptic lights festival or Coldplay-worthy music video. 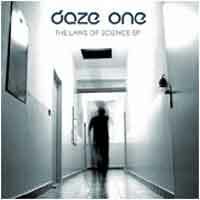 You can listen to clips from The Laws of Science at their web site – http://www.dazeone.co.uk to entice you to snag a copy of the EP before the price shoots up to import standards. And then you can say you heard them before they were huge, and give yourself an elite status.